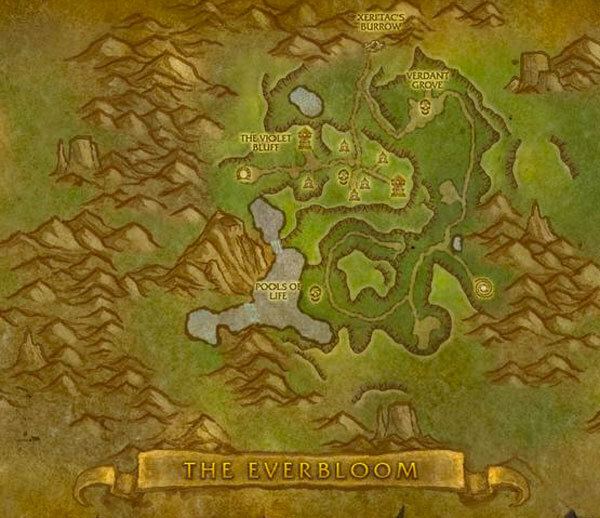 Everbloom is a level 100 Warlords of Draenor instance found in Gorgrond. The instance contains five different bosses and can be completed on normal, heroic, and challenge modes. On normal mode the bosses will drop rare ilevel 615 items. The five different boss encounters in this dungeon are: Witherbardk, Ancient Protectors, Xeri’tac, Archmage Sol, Yalnu. This encounter is an alternating two phase fight where players must try to extend the second phase as long as possible so that you can deal more damage. In the first phase of the fight the tank should face Witherbark towards the water and players should stay on the far side of him towards the land. During this phase Witherbark will cast Unchecked Growth on random players, anyone other than the tank should kite this effect away to the back of the area and away from the water. Once the vines catch you, move away to stop taking AOE damage. This phase continues until Witherbark reaches 0 energy, at which point phase two starts. In phase two Witherbark becomes immobile as he slowly gains back energy, he also gains a debuff that makes him suffer double damage. During this phase Aqueous Globules will spawn and move towards Witherbark. They are killable and can be knocked back. Once four of these orbs reach Witherbark his energy bar will be filled and the fight will revert back to phase one. Additionally, anytime an Aqueous Globule crosses over an unchecked growth it will spawn an add that will need to be killed, the adds are extremely dangerous though and take time away from DPSing the boss to the orbs should be killed before they touch the growths if at all possible. The best way to beat the fight is therefore to maximize the time in the second phase by killing the orbs and keeping the boss in this double damage phase. The second encounter is a council type fight against three bosses at once, they are: Life Warden Gola, Earthshaper Telu, and Dulhu. The order listed is also the best kill order to minimize the dangerous abilities each of the three have. Dulhu is the only boss that can be tanked and therefore should be held near the current kill target. Dulhu has an ability called Noxious Eruption that is an AOE damage and knockback ability that players need to get away from as soon as it is cast. The first kill target should be Gola, which needs to be stunned and interrupted as often as possible to stop the casting of Revitalizing Waters which heals all other bosses for 15% and Rapid Tides which removes cooldowns on the other bosses. The second kill target is Earthshaper Telu who cases Bramble Patch which is an AOE damage zone and Briarskin which prevents most of the damage against the protected target for a short time and deals damage to anyone who attacks the target. The fight is all about getting away from AOE damage and killing the targets quickly while still interrupting and preventing as many abilities as possible from being cast. This encounter is an optional encounter on both normal and heroic modes that you may skip if you want. If you decide to play through this encounter you will need to fight through a gauntlet style phase to reach the boss. Once you get through the gauntlet your will reach Xeri’tac and the fight will start. The main mechanic in this fight is dealing with the many Venom-Crazed Pale Ones that will spawn and attack players, while still dealing damage to Xeri’tac. This can be done by quickly killing them or by using long term CC abilities like Freezing Trap, Hex, and Polymorph. Any add left alive can be targeted by Zeri’tac to be Consumed, which will heal her for a significant amount of health and prolong the fight dramatically. The fourth encounter in the instance is against Archmage Sol who is possessed by a parasitic growth in he brain. The fight has three different phases that can be slightly controlled by interrupting abilities or not. The phases do not significantly change the fight but do deal different types of damage. Archmage Sol deals fire damage to begin with in the form of large rings of fire. These rings deal heavy damage to all players that are hit. In the second phase she deals heavy frost based damage with her Frozen Rain ability. In the last phase she deals Arcane damage to all players with her Arcane Blossom damage ability. Throughout the fight Sol will also cast other fire, frost, and arcane abilities as appropriate but that are of less concern. Players can control when she moves between phases by interrupting the Parasitic Growth ability, or not, as they choose. If interrupted Sol will move to the next phase, if not she will gain 50% damage. It is best to let her get at least one buff in each of the first two phases so that the last phase does not overwhelm the healer. The last encounter in the instance is against the massive Yalnu, however you will be assisted by a group of Kirin Tor mages. The mages will help you throughout the fight by dealing damage to the boss and the adds, however they will need your help occasionally, so watch for any that get hit with vines and free them quickly. The boss should be tanked in the center of the area. The tank also needs to worry about picking up any adds that spawn and pull them to the center for players to AOE them down. All players need to watch out for two main boss abilities called Colossal Blow and Genesis. Colossal blow deals heavy damage in a cone in front of the boss as stuns anyone caught in its AOE. Genesis is even more dangerous as it spawns many flowers around the area that will grow into dangerous adds called Swift Sproutlings. Players need to quickly run around and stomp on the flowers to stop them from growing. Any step on them will stop their growth and you can then move on, the more you kill at this point the less adds you need to deal with. In addition to the swift sproutlings there are several other adds that will spawn called vicious mandragora, gnarled ancients and feral lashers. All of these need to be kills off. While adds are active the tank will be taking heavy damage, so the healer will have to be prepared to deal with it with cooldowns. The tank should also save any damage prevention cooldowns for groups of adds.